San Miguel de Allende has become famous worldwide as a mecca for foodies. Its street food, regional Mexican dishes, and high-end, chef-centric restaurants together are a huge draw. But for fast food? Well, yes, with The Kitchen at Dôce 18 Concept House part of the scene. The Kitchen is a food court. But don’t let that description put you off. This place feels more like it’s been transplanted from the hipsterest neighborhood in Brooklyn or Vancouver or somewhere in Europe–a little pricey, a lot polished, and some truly great fast food. Think sleek chic. Think casual uber-sophisticated. Think post-industrial design meets colonial-style architecture. The Kitchen is all that. Fast food it is, but McDonald’s it ain’t. Menu: Although each spot in the court has a limited menu, combined they offer quite a few options. Super-good burgers, exquisite tacos, the best mac ‘n’ cheese, rice pudding, real Italian pasta and pizza, trendy tea, and an ice cream dessert we’re betting is new to you. Thoughts: The Kitchen is a surprise for most visitors to San Miguel de Allende. Taco stands are expected. Restaurants for such wonderful Mexican fare as Mole Poblano and Chiles en Nogada are thick as mariachis. And the fine dining scene has exploded in the last ten years, with new chef-owned places opening almost monthly it seems. But gourmet fast food was a totally new look when The Kitchen appeared on the scene two years ago. Its location just half-a-block from the Jardín, San Miguel’s central plaza, hasn’t hurt, along with the fact that the Dôce 18 Concept House also houses a collection of wonderful boutiques, a champagne tasting room, a spot for trying out area wines, a gourmet chocolate shop and the Tres Dragones tequila tasting room (reservations required, as it only seats six people at a time). 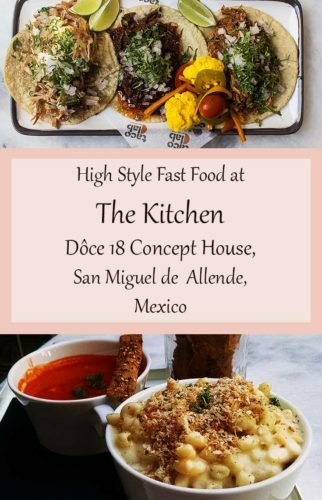 The Kitchen food court is located in the center of the “concept house,” a bright courtyard with a casual vibe and a post-industrial look deep inside the traditional colonial-style building (built in 1942 but mimicking its 18th-century neighbors). After checking out the offerings from the various vendors, you order at one of the counters, then find a table and wait for your food to be brought to you. * Birdie’s Burgers – For those craving a good ol’ hamburger like the best ones you’ve had in the States, this is the spot. Chef-owner Donnie Masterton believes a great burger starts with the best beef available. His comes from the local Cañada de la Virgen ranch, pure organic grass-fed and grass-finished pasture-raised beef. The homemade buns are baked daily. Tall, well-dressed and dripping with Chef Masterton’s special sauce, these “vertical burgers” are definitely a multi-napkin meal. For non-beef eaters, there’s a chicken thigh burger, crunchy and spicy and topped with slaw and cilantro-lime mayo; the Hippie Chick veggie burger with falafel and sprouts, veggies and tahini sauce; or the Cali Girl, with a salmon patty, avocado and Dijon mayo. The cheese fries are locally famous. And there are shakes! Real milkshakes in half-a-dozen great combinations of flavors. My favorite is the Pecan Pie shake with vanilla ice cream, candied pecans, and salted caramel sauce. I’ve been known to walk across town in the rain just for one of these babies. Breakfast is also served until noon, including eggs any style or eggs over fries with cheddar and salsa. * Taco Lab by Tacolicious – Another Donnie Masterton outlet, in collaboration with the famous Tacolicious restaurant group in San Francisco. The chef believes tacos are “food for the soul” and sets out to prove just how nourishing and delicious that can be. Using locally sourced ingredients, he fills his tacos with such creative combinations as Shot-and-a-Beer Braised Chicken, Guajillo-Braised Beef Brisket, and Charred Octopus. There is a Baja style fish taco properly served with cabbage and that wonderful Mexican pork dish, Cochinita Pibil, served with pickled red onions and cilantro. For vegetarians, there is a seasonal veggie taco. Breakfast tacos and burritos are served in the morning. * Mac and Soup – Here your choices are pretty simple since there are only three things on the menu: Mac & Cheese, Soup, and Rice Pudding. But don’t let that fool you. This is wonderful food with a range and depth of flavors, inspired by French and Italian cuisine. Not your mama’s mac ‘n’cheese! (No offense to mom—this is just different.) I’ve had the Spanish Mac & Cheese, and it was a revelation. Dense with flavor, it’s made with Spanish manchego cheese, carmelized onions, sherry and tomillo and was probably the best mac and cheese I’ve ever had the pleasure to eat. A friend had the Mexicano, with goat cheese, huitlacoche (corn fungus known as Mexican truffles), serrano chiles and epazote, a traditional Mexican seasoning. The tomato soup has a depth of roasted tomato flavor that sings in your mouth. You can choose from up to half-a-dozen types of rice pudding. My favorite is the one with cocoa nibs. * Cent’anni Grill – This is a faster and smaller extension of Cent’anni Restaurant, a local favorite for truly excellent and authentic farm-to-table Italian food. The name comes from a popular Italian toast that offers a wish for 100 years of everything good—good food, good health, happiness and prosperity. Here you can get meat cuts from the grill, pizzas and pastas as well as beautiful, thick focaccia sandwiches. Their most popular dish, the artichoke with four cheeses, is worth the trip all by itself. The meat lovers’ pizza will have you waddling out. Cent’anni Grill also serves breakfast. The French toast is wonderful. If you are just up for dessert, order the giant calzone filled with Nutella, strawberries and bananas. * Euro Té – This tea shop was created by Olivia Medina, the very first certified Tea Master in Mexico. She offers more than 70 types of teas and tisanes in this sleek, small space. Included are many combinations she has blended herself. The menu includes hot and iced teas, fruit infusions, frappés of tea combined with juice or milk. Among the blends I’ve tried, my favorites were the berry cabernet eurofusion, the white tea with melon and honey, and the Bora Bora—just close your eyes and let it carry you off to your tropical island paradise. Have a cuppa at a table or pick up a bag of loose tea to take home. Better yet, do both. The space also sells some lovely accessories for brewing and serving your perfect pot of tea, including pots and creamers, infusers, etc. * Mochi Yu — This is a lovely little dessert I’d never heard of until I saw it here. A Japanese dessert compiled of a slightly flattened ball of wonderful ice cream, in unique flavors, wrapped in a thin layer of sweetened rice dough called “mochi.” It sounds a little weird, perhaps, to us Westerners, but I assure you, it is a bite fit for the angels. Now in Mexico by way of Hawaii, its popularity seems to be growing worldwide. And with good reason. There’s a pretty long list of what they call “guilty flavors,” from the usual vanilla, strawberry and chocolate mint, to tiramisu, lychee, and maracuya. I loved the mango and the chocolate espresso. And since the coating is made from rice flour, they are gluten free. A mochi makes a wonderful way to finish a meal and an even better way to pick yourself up with a refreshing treat on a warm summer day of walking around San Miguel. *Cent’anni Grill – The artichoke with four cheeses is about $10. Pasta dishes from $11-14. Pizza $11-16. *Taco Lab – three gourmet tacos and a beer will set you back $10-11. *EuroTe – a cup of glorious infusion costs about $3. *Birdie’s Burgers – From $5 for a Hippie Chick vegetarian burger up to $12 for a Double Truffle Shroom burger. Breakfast from $5-6. *Mac and Soup – a bowl of rich, cheesy mac and cheese plus a bowl of soup runs about $14. Soups alone are $5-7.50, Rice pudding about $4.